Here are the changes coming on Tuesday, April 24. Warning: this is a big one! Maintenance will begin at 11 AM EDT (3 PM UTC) and is expected to last about one hour. We’re overhauling the progression system to give you the ability to earn a variety of cosmetic items as you level up. 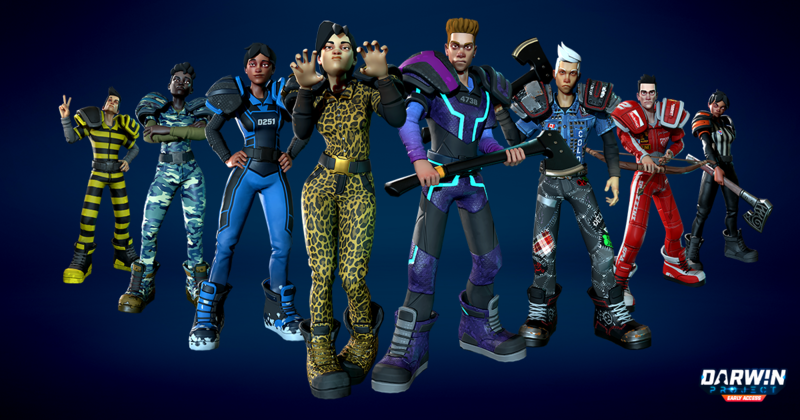 As you play Darwin Project matches and gain Fans, you’ll occasionally receive Fan Gifts. Open these packages to discover new styles for your clothes or weapons. We hope you’re excited to start expanding your collection, because we’re adding over 200 items on Tuesday, with more coming later! Spectator Interactions: Now with More Votes! UPDATE 4/26: Following your feedback, we’ve undone these changes. All zone closures will be voted on by the public, regardless of whether there is a Show Director in the match. This guarantees many votes are launched in a match, giving more control to the audience. In matches where nobody joined as a Show Director, an AI will take over the Show Director drone and use Powers whose targets will be voted on by the audience! The Powers that the AI Show Director will be able to use are Nuke, Manhunt, Warm Up, Heal, and Gravity Storm. In short, if you’re looking to watch some Darwin Project matches, all streams where at least one contestant in the match is streaming (and connected to Twitch/Mixer) will allow you to have a say in the match by voting! 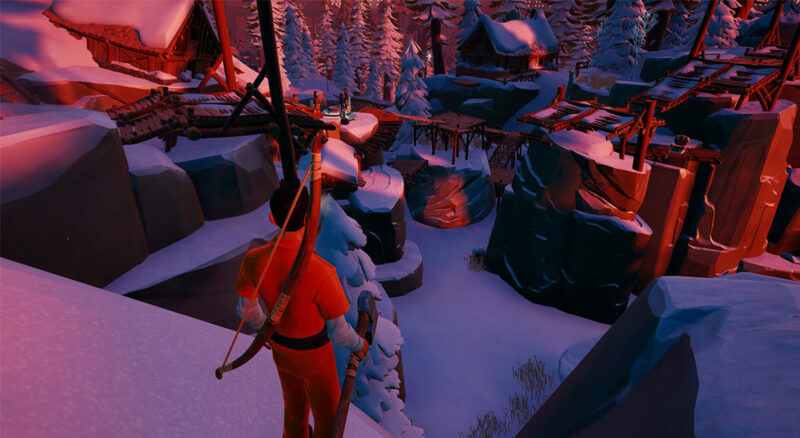 Finding the sweet spot for what Show Directors can and cannot do has probably been the most persistent challenge of Darwin Project’s development so far. Our vision for the role of the Show Director continues to be entertainment-first, with the contestants’ ability to negotiate and win over the Show Director an important factor in the outcome of the match. Unfortunately, some players still feel that Show Directors directly granting Powers such as Heal and temporary Invincibility to an inmate counts as an unfair advantage. The Show Directors themselves sometimes have trouble dealing with the negativity this creates, so we’ve decided to change the way targets for Show Director Powers are decided. On Tuesday, all Powers that require a player target will cast a vote to the audience. UPDATE: Thanks for your feedback! We've updated this so it'll only affect Show Directors with a rating of 3 stars or less. There’s a sense among players that if a group of viewers decides which contestant receives an advantage, that player has earned it―but the Show Director’s decisions aren’t received the same way. We hope this change will have a positive impact on both contestant and Show Director experiences while still allowing Show Directors to make matches a blast to watch. Note: this change doesn't affect Private Matches. Further improving and adding depth to the Show Director role is on high priority for our future updates. Please let us know what you think about this update on any of our official channels as always, and we’ll keep working until we get it just right. Another frequently requested improvement! Playing in Duo Mode, Private Matches, and as the Show Director, will now also allow you to gain Fans. This means that Duo and Private Match enthusiasts will also be able to fill up their Dressing Rooms with new gear starting April 24. (Don’t worry, Show Directors, we haven’t forgotten about you). We're proud to say that the Darwin Project community is THE MOST AWESOME community there is in this industry. From the bottom of our hearts, thank you so much for this nice surprise. We never thought we'd get sushi and pizza gifted by our inmates. Update: To get a refund, you need to get in contact with Steam Support and they will refund regardless of purchase date.